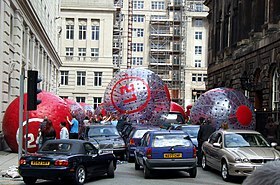 The city of Liverpool, England, is a popular location for the filming and setting of films and television series, both fictional and real. The following article provides a list of films and television shows which have been partially or wholly set in or shot in Liverpool. The list includes a wide array of films and TV shows, ranging from those that were almost entirely shot and set in the city (e.g. 51st State, Brookside) to those where only a small number of scenes were set or shot in Liverpool (e.g. Across the Universe). Media is an important component of Liverpool's economy and in 2009 brought over £13.5m into the local area. After London, it is the most filmed city in the United Kingdom. The Liverpool Film Office, founded in 1989, was the first of its kind in the United Kingdom and along with North West Vision and Media and the UK Film Council acts to promote the city to film and television producers. In addition to attracting outside producers, Liverpool is also home to Lime Pictures, the UK's largest independent television production company. Liverpool's rich architectural base means it is frequently used as a double for major cities across the globe, including Chicago, London, Moscow, New York, Paris and Rome. It is also able to utilise a large number of historic sites within the city that are openly available for filming, including the now decommissioned courtrooms of St. George's Hall, or the nineteenth century warehouses around Stanley Dock. Coast to Coast 1987 Comedy thriller starring Lenny Henry that was set and filmed in Liverpool. David Copperfield 1999 BBC & WGBH adaption of the Charles Dickens story. The Fruit Machine 1988 British thriller set and filmed in Liverpool. Going Off Big Time 2000 Gangster & crime film that was set and filmed in and around Liverpool. Hear My Song 1991 Drama based on the life of tenor Josef Locke. Partially set and filmed in Liverpool. Creed 2015 Spin off from the Rocky series of films. Goodison Park was used as a filming location. Between the Lines 1992 The episode "Lest Ye Be Judged" was set in and around Liverpool and New Brighton. ^ a b "Film Office". Liverpool City Council. Archived from the original on 4 November 2010. Retrieved 18 October 2010. ^ "film locations". VisitLiverpool.com. Retrieved 18 October 2010. ^ a b "Locations, crew and facilities databases". Liverpool City Council. 12 January 2010. Archived from the original on 19 June 2010. Retrieved 4 March 2010. ^ "Host City: Liverpool". England 2018. Archived from the original on 16 February 2010. Retrieved 4 March 2010. ^ a b c d e f "Filming opportunities :: St George's Hall, Liverpool". www.stgeorgesliverpool.co.uk. Archived from the original on 29 August 2009. Retrieved 2 August 2010. ^ Gunby, Emma (24 January 2002). "51st State wins at box office". Liverpool Echo. Retrieved 18 August 2009. ^ "Southport & Mersey Reporter". Southport Reporter. Retrieved 12 December 2001. ^ Holden, Stephen (14 September 2007). "Lovers in the '60s Take a Magical Mystery Tour". New York Times. Retrieved 18 August 2009. ^ "An Awfully Big Adventure (1995) - Filming locations". www.imdb.com. Retrieved 3 August 2010. ^ "Backbeat". IMDB. Retrieved 8 October 2010. ^ "Filming locations for The Crew". IMDB. Retrieved 1 October 2010. ^ "No Surrender". IMDB. Retrieved 16 October 2010. ^ "On the set of Ken Loach's 'Route Irish' with Time Out Film - Time Out London". www.timeout.com. Retrieved 27 March 2010. ^ "Shirley Valentine". IMDB. Retrieved 8 October 2010. ^ "Three Businessmen". IMDB. Retrieved 8 October 2010. ^ "Violent Playground". IMDB. Retrieved 1 October 2010. ^ "Waterfront". IMDB. Retrieved 1 October 2010. ^ Koncienzcy, Rebecca (12 February 2019). "Danny Boyle kills off The Beatles in new Hollywood movie". liverpoolecho. Retrieved 12 February 2019. ^ "Win Each Way". IMDB. Retrieved 1 October 2010. ^ a b c d e "New York, Russia, Hogwarts - Liverpool can do it all". Liverpool Echo. 8 September 2009. Retrieved 8 September 2009. ^ "Awaydays". IMDB. Retrieved 1 October 2010. ^ "Filming locations for Blonde Fist". IMDB. Retrieved 16 October 2010. ^ "Filming locations for Chariots of Fire". IMDB. Retrieved 1 October 2010. ^ "Downtime (1997)". Retrieved 12 October 2017. ^ Jones, Catherine (15 November 2016). "Filming Fantastic Beasts in Liverpool was amazing says producer". Liverpool Echo. Retrieved 10 October 2017. ^ Jaleel, Gemma (13 November 2012). "Film crews shoot latest Fast and Furious movie in Liverpool (GALLERY)". liverpoolecho. Retrieved 12 October 2017. ^ Parry, Josh (28 June 2016). "Hollywood actors spotted filming in city centre". Liverpool Echo. Retrieved 11 October 2017. ^ "Filming locations for Florence Foster Jenkins". IMDB. Retrieved 10 October 2017. ^ "Genius (2016)". Retrieved 28 April 2018. ^ "Mersey Tunnels feature in film of Harry Potter and the Deathly Hallows". Liverpool Echo. 8 September 2009. Retrieved 8 September 2009. ^ "Filming locations for In the Name of the Father". IMDB. Retrieved 1 October 2010. ^ "Filming locations for Jack Ryan". Retrieved 14 September 2012. ^ "Filming locations for Millions". IMDB. Retrieved 1 October 2010. ^ Houghton, Alistair (28 April 2018). "Revealed: Why Keira Knightley was spotted in Liverpool". Liverpool Echo. Retrieved 28 April 2018. ^ a b Houghton, Alistair (11 October 2017). "Tolkien film will be shot in Liverpool this year". Liverpool Echo. Retrieved 13 October 2017. ^ Goddard, Peter (May 2009). "Boys from the Blackstuff". Museum of Broadcast Communications. Retrieved 2 September 2009. ^ "Bread". BBC. Retrieved 3 September 2009. ^ Hallam, Julia. "Bread (1986-91)". Screen Online. Retrieved 3 September 2009. ^ "Broadchurch 3 Filming Locations - ITV Drama 2016". www.westbay.co.uk. Retrieved 12 March 2019. ^ "Brookside (1982-2003)". Screen Online. Retrieved 3 September 2009. ^ "The Bullion Boys". IMDB. Retrieved 16 October 2010. ^ Parry, Josh (26 April 2017). "David Morrissey's BBC drama spotted filming in Liverpool city centre". Liverpool Echo. Retrieved 11 October 2017. ^ McCoid, Sophie (15 April 2018). "Look at the secret Cotton Exchange rooms transformed for The City and The City". liverpoolecho. Retrieved 15 April 2018. ^ McCoid, Sophie (6 August 2018). "Huge Netflix drama filming in Liverpool city centre". liverpoolecho. Retrieved 6 August 2018. ^ Coen, Susie (12 November 2016). "Seven Liverpool locations featured in Poliakoff's drama". Liverpool Echo. Retrieved 13 October 2017. ^ Dunn, Connor (10 March 2018). "Army TANKS spotted driving around Liverpool city centre - here's why". liverpoolecho. Retrieved 12 March 2018. ^ McCoid, Sophie (18 May 2018). "This is what TV show was filming at Formby Beach yesterday". liverpoolecho. Retrieved 19 May 2018. ^ Rampen, Julia (14 April 2019). "See Liverpool transformed into 1940s New York". liverpoolecho. Retrieved 17 April 2019. ^ McMenemy, Rachael (7 April 2019). "Netflix spotted filming football drama by Downton Abbey creator in Liverpool". liverpoolecho. Retrieved 8 April 2019. ^ Finch, John (October 2003). "Production of a 'Family at War'". John Finch. Retrieved 3 September 2009. ^ Koncienzcy, Rebecca (11 January 2019). "Here's why you may have seen 15 crashed cars in Liverpool city centre". liverpoolecho. Retrieved 11 January 2019. ^ Jones, Catherine (1 January 2015). "Latest series of Foyle's War filmed in Liverpool hits our screens". Liverpool Echo. Retrieved 11 October 2017. ^ Kirkham, Jenny (13 November 2018). "Behind the scenes photos show Suranne Jones filming in Liverpool". Liverpool Echo. Retrieved 13 November 2018. ^ Conlan, Tara (6 February 2008). "BBC expels Grange Hill". London: The Guardian. Retrieved 3 September 2009. ^ "Chester soap Hollyoaks not filmed so much in Chester anymore". How Do. 24 June 2008. Archived from the original on 4 May 2009. Retrieved 4 September 2009. ^ Shennan, Paddy (10 December 2017). "The Liverpool house which will be the star of a new TV series". liverpoolecho. Retrieved 2 April 2018. ^ Wright, Jade (25 August 2015). "Filming sees stars leap off buildings for Houdini and Doyle". Liverpool Echo. Retrieved 13 October 2017. ^ Miles, Tina (4 March 2011). "Popular children's drama House of Anubis filmed in Liverpool for USA audiences starts in UK". liverpoolecho. Retrieved 12 October 2017. ^ "Lennon's housebricks for sale". BBC News. 9 November 2000. Retrieved 24 November 2018. ^ "LILIES". world-productions. Archived from the original on 12 November 2008. Retrieved 4 September 2009. ^ Hallam, Julia. "Liver Birds, The (1969-79)". BFI Screen Online. Retrieved 4 September 2009. ^ "Liverpool 1". Screen Rush. Retrieved 4 September 2009. ^ "Ricky Tomlinson is "Nice Guy Eddie" - (Eddie McMullen) in a new six-part drama series from BBC Northern Ireland starting soon on BBC ONE". BBC. 31 May 2002. Retrieved 4 September 2009. ^ "Filming the Onedin Line at Exeter Quay during March 1976". Exeter Memories. March 2009. Archived from the original on 24 September 2009. Retrieved 4 September 2009. ^ "One Summer (1983)". BFI Screen Online. Retrieved 4 September 2009. ^ a b "Exciting location filming projects Hosted by National Museums Liverpool". blog.liverpoolmuseums.org.uk. Retrieved 6 August 2018. ^ Houghton, Alistair (11 October 2017). "Tolkien film will be shot in Liverpool this year". Liverpool Echo. Retrieved 11 October 2017. ^ Houghton, Alistair (10 April 2017). "Here's what they're filming inside Liverpool's Martins Bank". Liverpool Echo. Retrieved 10 October 2017. ^ Duffy, Tom (21 March 2018). "Part of Liverpool is bracing itself for an alien invasion". liverpoolecho. Retrieved 21 March 2018. ^ Kirkham, Jenny (12 June 2018). "This is what they were filming in Liverpool's Georgian Quarter today". liverpoolecho. Retrieved 12 June 2018. ^ Hughes, Lorna (8 February 2019). "Why do these local woods look like a WW2 army camp?". liverpoolecho. Retrieved 9 February 2019. ^ "TV Review: Worried About The Boy (BBC2)". Liverpool Echo. Retrieved 3 October 2010. ^ "Godly Play Case study: St Andrew Tower Hill, Kirkby". Giving Grace. Archived from the original on 3 December 2008. Retrieved 4 September 2009. ^ a b "LIVERPOOL ADVERTS". Seven Streets. Retrieved 3 October 2010. ^ "Liverpool's 'owt in front as Hovis ad hits streets". Liverpool Daily Post. Retrieved 3 October 2010. ^ "Virgin Trains: Arrive Awesome - Making Of". kworks. Retrieved 10 December 2017. ^ "FILMED IN LIVERPOOL- VODAFONE-MO SALAH". Liverpool Film Office. 16 March 2018. Retrieved 2 April 2018. ^ "FILMED IN LIVERPOOL- NIKE COMMERCIAL". Liverpool Film Office. 30 January 2018. Retrieved 2 April 2018. This page was last edited on 17 April 2019, at 21:50 (UTC).